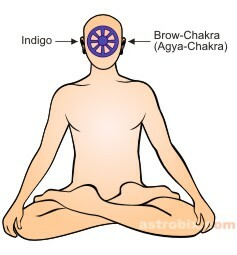 Indigo color is related to our Brow Centre or the third eye. This chakra is located at the exact center of a person’s forehead. The organs linked with this chakra include, eyes, lower part of the head, sinus, and the pituitary gland. This color is related to self responsibility. This means, to be, responsible for your life and your existence. To know your inner soul and lead it on a good path. Have faith on your intuition or instincts. People with the prime qualities of this color have a high capacity to identify themselves and for ego satisfaction. This color gives the individual a distinctive quality which sets him apart from his colleagues. People of this color are known for their unique message of instinct rather then self interest. The positive qualities of people having balanced proportion of Indigo color, in them, are:- high intuition, faithful and loyalty, sense of unity, devoted towards their duty. They are fearless and practical. They turn out to be idealistic and straight forward. The person who does not have balanced amount of Indigo color, shows these negative aspects:- separatism, timid personality or gets intimated soon. They are not at all practical, don’t care about others, inconsiderate and unreasonable. Can get upset very soon or are disturbed with small things. Disorders related to Brow Chakra are headache, tension, visual defects, migraine, short and long sightedness, sinus, ear problem and glaucoma. Indigo color is used in order to cure these disease. Indigo color, give peace and intuition to an individual. The color symbolises divine knowledge and high ideas. This color is useful for places where more of ‘peace’ is required. This color is considered perfect for bedrooms and places where, a person is undergoing treatment. The color is useful for teaching or studies, therefore, it is great when used in library or education places. The color is not useful for entertainment venues. Include a indigo colored clothing item or accessory in your attire regularly. Keep a indigo colored piece of crystal or glass in your workplace, or in your home. Use a indigo colored night-dress so that you may benefit from the energies while you sleep. Use indigo colored bulb or night-lamp. If you don’t find a indigo colored bulb, you can use a indigo colored film to wrap around a regular white bulb. Include indigo color in your home furnishing. Visualize the indigo color in your head during the day.